IN JUNE, 1976, after a final three night run at the Great American Music Hall, the Glass Packs vowed to throw their own pies in life and never to share the stage again. The break up of the band was at best bittersweet, with an unfinished comedy recording project left in the can. The ensuing seven years allowed each Glass Pack the time to establish his own career and gain a bit of perspective on what we did (and why we did it) with some very valuable time. Mind you, nobody felt that three years of Pioneer Week, four years of touring to Vancouver, Miami, Chicago . . . and five years in floppy shoes was time wasted, even though we didn't get the T.V show we needed to showcase our act. But after seven years of serenity, each was prepared to prance like a show pony in silly costumes once again. However, we hadn't seen one another in seven years, longer than we were together and, in most cases, hadn't sung or played an amplified instrument since our last performance in 1976. To re-group was a more formidable task then the one that resulted in our first performance at Alpha Phi (see Chapter One) 12 years before. And so in early 1983 the search light shining the Glass Packs' logo in the sky found some of us toiling behind desks in office buildings, hotels and golf courses, others on construction crews, still others in television production studios and a few on the road with other bands. It was through a series of carefully orchestrated phone calls that Butch contacted each of the Glass Packs for the first time in years and obtained a commitment to do whatever it took to re-build the engine and take the time machine for another spin around the track. The words "Well if he's in, I'm in and you're not doing it without me" will be written on Rocco Vaselino's tombstone. Soon thereafter, twice a week rehearsal began and continued unabated until the June date with destiny at the Great American Music Hall. Only this time, the band consisted of everyone who was ever in it -- fifteen hambones strong, -- Danny, Laz and Craig from the original St. Mary's corps were introduced for the first time to their successors and now fellow Glass Packs, drummer Mike Moore, sax man Karl, and Rob Birsinger who switched from guitar to bass where he has remained for 18 years. The Mighty Quinn came in from Nashville, Bruce-He's-So-Fine- Lopez in flew in from Arizona, Gary Murphy and Larry Strawther came up from L.A. The First Annual Farewell Performance was a logistical and expensive nightmare. While the local Glass Packs attended to the burden of rebuilding the musical Ark from scratch, TV writers Gary and Larry (then with the Tonight Show and Merv Griffin Show, respectively) began writing a completely new show, radically different from the one that we had last performed, ambitious beyond belief. Even now, eighteen years later, we couldn't pull off Napoleon the XIV's "They're Coming to Take Me Away (Ha Ha, Hee Hee, Ho Ho... to the Funny Farm)" delivered like a quietly insane night club singer on a saloon stool nattily dressed in a straight jacket, physically removed by white coated waiters with song playing them off. But if called upon, Craig could and would do it again. The road to opening night at the Great American Music Hall was long and bumpy. 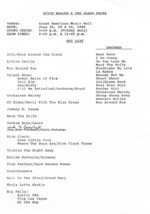 Where in the past we had performed a one hour first set and a fifty minute second set, the 1983 1st annual Farewell Performance featured two 75-minute sets worth of new material and we were hell-bent to perform all of it, notwithstanding the consequences. Thus, the standard for all succeeding Annual farewell Performances was set in the first one -- these would never be sad reunions, they would always be Hair on Fire, Seat of the Pants, Catch-Us-If-You-Can hopelessly ambitious projects, seemingly impossible to execute with the 15 different travel and career commitments, the limited amount of time available for rehearsal and the distance that separates the band members. Each Annual Farewell Performance would be and has been more difficult than the one before it. We don't have time to look back.